I start the year thinking I will start anew, begin a new habit and get this year right. However, that’s never how it works. *I never take all of my vitamins each day. *I never use the face cream I bought. *I never make one of my bucket list trips I’ve wanted to take year after year (specifically New York City, the United Kingdom, France or Italy). *I rarely stay on a diet and/or lose a few pounds. *I rarely go to the gym multiple times per week each week of the year. *I never read more books, watch less TV, spend less time on social media. *I rarely go through boxes of old things from 10 years ago and discard items I will never need again. Now, others in the faith believe there is one true belief. There is one way to salvation. There is one way to relationships. There is one way to handle situations. There is one way to look at the Divine, Christ and Communion. When it comes down to it, our experiences become our filter. No one person can see the way another one can. Our race, gender, class, sexual orientation, disabilities, education and a number of other filters the way we process our beliefs and see the world. When I sit here seeing these resolutions debated, whether because of the content or alphabetizing a list, I don’t see complete uniformity. And I thank my God for this. In many of our communities, there is a misconception. Those in our churches often see “the UCC supports” in newspaper articles and other press materials. But this isn’t fully true. 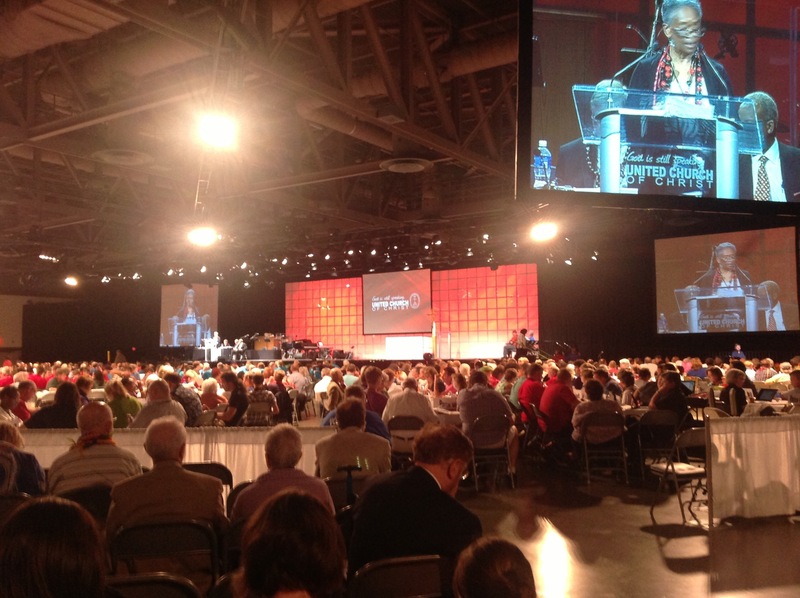 The United Church of Christ gathers together to vote on issues. Some of these issues have much disagreement. When the UCC takes a stand on issues, it has taken their stance from a resolution at a previous General Synod. The majority has affirmed the position, but it never represents all UCC churches or congregants. As I sit here, I know there is a great diversity of people sitting around me. I thank God for this. It forces me to open my eyes to the experiences of my neighbors. It forces me to reevaluate my beliefs and strengthen my position on issues. But sitting here, I am forced to keep in mind that those who oppose what I believe are humans. I see their faces. They are part of the Body of Christ along side of me. If you ever get the chance to attend the UCC General Synod or the assembly of your denomination’s believers, take it. Your eyes will be opened to the relational God in your midst. You’ll see a denomination which reflects a diversity of beliefs. If you are open to celebrating your faith with a wide diversity of neighbors (and awareness that we are all made in God’s image), you will most likely feel that the United Church of Christ is for you. We reflect the true diversity of Christianity in a spirit of unity.